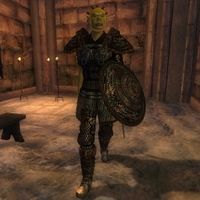 Mazoga the Orc will initially be encountered in Leyawiin, insisting somewhat insecurely that she is a knight. Talking with her leads to the quest Mazoga the Orc, during which you will learn a bit more about her less-than-chivalrous past, and give her (and yourself) a chance to become a real knight. It is important to either complete Mazoga's quests before you have completed Sanguine's quest, or not start them at all before you have completed Sanguine's quest. The reason for this is that after you've set up the prank, Mazoga will fight the numerous castle guards until she (most likely) dies- which will forfeit her quests. Alternatively, you can complete Sanguine's quest without fleeing the castle, in which case Mazoga is not endangered. If you have already stumbled into this problem, and much time has passed since you completed Sanguine's quest, consult the Quest Discussion Page for ways to avoid Mazoga's death and complete the quests. Old-style Breadcrumbs: I put this together to remember exactly what the old-style breadcrumb trails looked like; compare to Mazoga_the_Orc_(person) to see the new-style breadcrumb trails (the breadcrumb trail is the part that reads "Oblivion: People"). See discussions at UESPWiki:Community_Portal/Bread_Crumb_Trail and UESPWiki:Community_Portal#Breadcrumbs for relevance. The style I used here was taken from the bread-crumb style on Nov 26, immediately before the bread crumb location was first changed. The only difference is that I've changed the background color from #F8F8F8 to #FDF5E6, to go with the new monobook skin color scheme. This page was last modified on 28 July 2009, at 20:33.